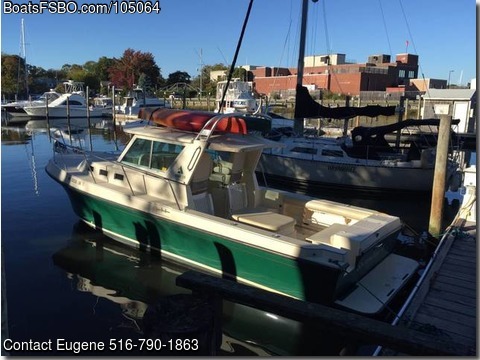 Call Eugene at 516-790-1863 3ith any questions..Our boat is in Superior Condition, well maintained and lightly used. We are the 2nd owners, after receiving from a man who used to fish twice a week only. The cabin was NEVER used, including the head. It is equipped with Green Awlgrip in '14, Glass beaded & Full Barrier Coat '16, Updates throughout. GMC 300 hp 750 original hours, New A/C, including Helm station in '14, Custom reclining Capt'n Seat, Auto Helm'15, New GPS Furuno '15, New Sitex Radar, Furuno Fish Finder, Stainless Anchor windlass '15, Bow Thrusters, Hard Top Mounted Kayak Racks, 3-D8 Batteries, Complete flow scan, Fuel monitoring system '16, Battery Voltage Monitoring System '16, Heat Exchanger '16, Oil cooler '16, Transmisison cooler '16, New belts and Hoses '14, New Raw Water pump '15, New Freshwater pump '14, Spare Alternator, Starter, & all around service parts, Injectors, Glow plugs. Custom retractable rear Canvas, Rear 3 Panel Canvas, LED lamps through out, Custom Sea Door '15, Spare bronze propeller, Blue tooth Fusion '16, Pantographic Wiper Arms and Blades' 16, New faucets '16, Custom Ultra Suede Back Cushions, Custom made form fitting Winter Storage Cover The only reason we are selling....we want to travel the ICW, with our two dogs and we just need a little more room, so we are upgrading to a 31 TE.